We have been developing software tools for handling forms, documents, fonts and images since 1995. If you want to know more, please get in contact and we will come back to you. Tools in our software suite can be used as an affordable alternative to LiveCycle forms. We can help to add interactive web forms into any existing system. The document can be edited in desktop design application. The documents is not limited to the web only. One can reuse the layouts for printing, archiving, generating PDF documents and other background tasks. Open XML based format defines graphics using generic 2D model, suitable also for high-end printing. Our tools can be used to extend information processing systems with presentable documents that work in web browser. It can also be used to build entirely new business application to collect from and present data to the users. We offer design software for creating and editing document layouts. These design tools can be used to create device-independent XML-based form definitions for use in web frontend and also in batch processing for generating reports, invoices etc. 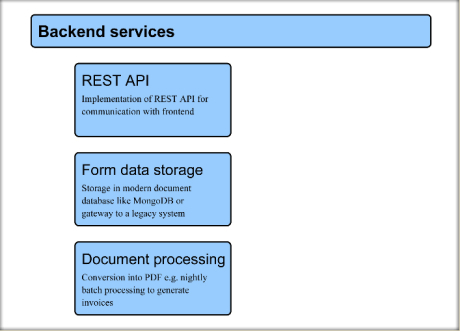 The backend communicates with the interactive form in front-end using REST API calls. We provide backend that uses MongoDB to store data. This backend can be used in production scenario or could serve as an example when integrating with other systems. To integrate with the system of your choice, the adapter needs to be implemented that works with the REST API towards web form. The document content is represented as vector graphics, using objects as lines, curves, text and images. The textual content is stored as Unicode. Colors in vector graphics can be defined in different formats (grayscale, RGB, CMYK, spot colors). Field objects define editable areas in document with additional rules for evaluating user input on client side. The document is divided into fragments. Simple document would define one fragment for each page making it similar to printed sheet of paper. It is however possible to define more complex layout of document template. The template document contains multiple fragments – building blocks out of which composite documents can be built. 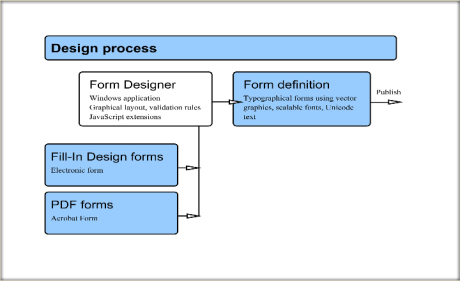 The variable data and the form template are merged by the layout process that runs in the client-side web application. The web application will receive template and variable data from backend and present these to user as a document instance. By loading in new set of data and re-applying layout, new instance is created on the fly. The validation rules can be applied to user-entered data on the client side. The client-side validation does not replace the final integrity check done in back-end, but it helps users to get the input correct and reduces need for server roundtrips. Client side scripting can be used to extend the form data validation. We are looking for partners and customers, dealing with forms and documents on Internet. The components of the system are built from ground up to enable user interaction in the web browser. Same document format can be used both for background processing and for web presentation. This approach enables layouts designed for printing and archiving to be reused in the interactive web solution. The form definition format is based on XML and has open specification. 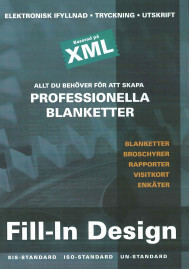 The XML format itself serves as an additional API for integrating with other systems. Main use case for our document format is the implementation of interactive forms. The forms can be displayed on the web to collect data from users, to show reports or act as a part of dynamic workflow. Document may include sections that are enabled or disabled according to workflow state. Documents can be created and edited using Windows desktop application. We are also working on input filters to convert documents from other formats (like SVG, PDF) and output drivers to render documents into common formats that can be edited and viewed using third party software.